How can you criticize standardized testing if you aren’t allowed to talk about the tests? To show why these assessments are bad, you have to be able to mention specific questions on the exams. But if you do that, you will be violating the test company’s copyright and thus be subject to legal action. So there will be no discussion of your concerns, no defense of the questions in question. Instead you’ll be threatened to silence. This is the Catch-22 for teachers, parents and children throughout the nation. 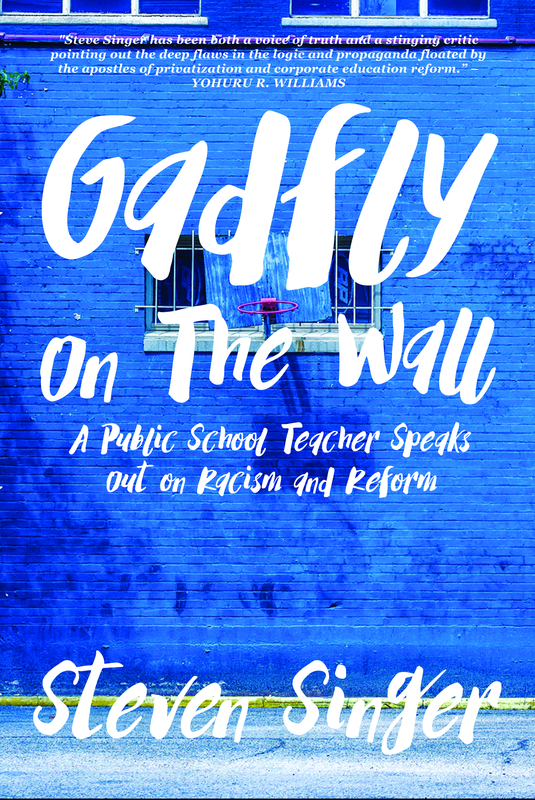 We know the federally mandated high stakes assessments public school children must take are poorly constructed, culturally and racially biased, and ultimately unfair. But if we speak up in public with any kind of specificity, we’re threatened with steep fines. And if we write about it on-line, those articles will be taken down, censored or otherwise disappeared. This is what happened to Prof. Celia Oyler of Teachers College, Columbia University this week when she posted an anonymous classroom teacher’s critique of the 4th grade PARCC exam on her blog. Since the article reproduced three live questions from the exam, Oyler received a threatening email from PARCC CEO Laura Slover. Oyler acquiesced to the CEO’s demand that she remove the PARCC questions, but she did not – as Slover commanded – reveal the name of her source. Oyler is debating legal action of her own against the testing company. Meanwhile, education bloggers across the country have engaged in civil disobedience by reprinting Oyler’s entire post along with the PARCC questions. Many of these articles have been taken down by Twitter, Facebook or other Internet enforcers. It’s a sad day in America when free speech is treated so disdainfully. These PARCC questions are considered private property, but in many important ways they are not. They were developed at public expense. They were funded by taxpayers for use in our public schools. As such, they should be subject to public review. And we may review them – privately. Ostensibly anyone could ask their local school district officials to be allowed to come in to the principal’s office and look over the tests. In fact, this is one of the first steps parents go through to opt their children out of taking the exams. You can page through the tests with supervision so you don’t make any copies or remove any materials from the building. I’m sorry. This is just not the same thing as putting these tests under public scrutiny. I can look at them, myself, and make up my own mind. So can you. We can even meet and talk about this together in our own private homes. But the second I go to a public forum like a school board meeting and begin to discuss these assessments in any detail, I can be charged with breaking the testing company’s copyright. And so can my child. In fact, multiple students have already been harassed on-line by test corporation Pearson for allegedly talking about their exams. This begs several questions: Can we legally hold minors accountable to such contracts without first providing them with legal representation of their own? Moreover, can they be forced to enter into these agreements without the presence of their parents or guardians? However, there is an even more basic question with more far-reaching implications for the entire high stakes enterprise: How can experts explain what is wrong with the tests, if they can’t talk about anything on the tests? Oyler mentions a question from the 4th Grade PARCC exam that is written at least two years above the grade level being assessed. Students are asked to read at a level beyond their years in order to find an answer. That’s patently unfair. But it’s one thing to make that claim – it’s quite another to point to the exact question and prove it beyond a shadow of a doubt. Unfortunately, this vital fact is being completely ignored. The testing companies have already silenced that debate. We’re not discussing the quality of the test anymore. We’re discussing free speech. It’s an important issue, but it isn’t the one we started with. Standardized assessments are not top secret military documents. Reproducing a test question that tens of thousands of students have already seen is not analogous to Edward Snowden or Julian Assange. Hundreds of test questions are already released by assessment corporations as examples to help with test preparation. Some of them even show up on the actual tests. Why not release them all? One couldn’t possibly go through every question and memorize the answers before taking the tests. When the assessment industry gets to show us only a portion of the questions they use, they’re bound to display only the least objectionable ones in the bunch. We’re accepting an illusion of transparency and forking out more than $1 billion annually for the privilege. A product created with such a wealth of taxpayer dollars should be open to public review and debate. At very least, we should demand these questions are subject to independent review. That doesn’t mean the testing companies get to hire so-called experts with ties to their industry to sign off on the questions. It means real experts should have a say. We should hear from PhD’s in the field like Oyler. We should hear from classroom teachers. We should hear from parents and even students. This is the only way we can ensure students are being assessed fairly. We shouldn’t just trust the huge corporations manufacturing this stuff. We have to know exactly what’s on the tests. Without such public scrutiny and outcry, test corporations have no incentive to better their products. In fact, this is exactly how New York State residents got rid of perhaps the most infamous test question ever reported – The Pineapple Question. You can read about the whole thing here, but the basic story goes as follows. Several years ago, students who finished their 8th grade reading test couldn’t get over how absurd this question was. They talked about it to anyone who would listen. Eventually, the question was reprinted on parent Leonie Haimson’s blog, Class Size Matters. It became a national head-scratcher. People all over the country called for the question’s removal. Without public input, the Pineapple Question might still be on the tests. Students could still be trying to answer a question almost everyone thinks is ridiculous. People often say they want more accountability in public education. Isn’t it time we started to hold the test manufacturers accountable for their products? Isn’t it time we restored free speech to public education? We can’t improve our schools if we’re more concerned with a private company’s copyright than we are with the quality of the product they’re providing us. We can’t have a functioning school system if whistle blowers are silenced. They can threaten us all they want but if we stand up to them and force them to take us to court, then they will be judged. It’s a gamble for both sides. They stand to lose much more than we do. I have always wondered about the legality of making my ten year old sign a “contract” I have never seen and he cannot understand. Great article. One correction: the only legal action I’m contemplating is defending myself and teachers and children! Thanks for clarifying that, Celia. And thanks for printing the original article that kickstarted this whole debate. Thank you. You have beautifully summarized all of the things I’ve been thinking & saying for the past year about this issue! Great piece–especially the critique of the “private” status of the tests. The late Ted Chittenden (who actually worked at ETS, but was a staunch and deeply knowledgable advocate of qualitative assessments and critic of the tests) asserted that transparency was a criterion of trustworthy assessments. This did not seem an outlandish claim at the time. I liked your Catch-22 reference. Here is a quote which captures the essence of “corporate education reform” and the testing industry. If the private company is receiving public money (which they are), then the public has a right to know what’s on those tests, once the tests are given. If they are judging teachers, schools, and students by these tests, then what the hell good are they if the students and the teachers cannot learn what the students may have gotten wrong in those tests? It’s all punitive, it’s not educational at all. Use the results to punish the schools, teachers, and students. And, while we’re at it, enrich the testing companies and the rest of the education-industrial complex. Transparency is clearly important here. Writing good questions is hard, but that is the job that these folks have signed up to do. If you can not come up with more than a handful of good questions, you need to find another line of employment. me out much. I’m hoping to give something again and aid others like you aided me. If PARCC can and will do this to individual bloggers, what, if not our own effects, prevent others from doing the same to retaliate against testing resistance?